Explore the home town of Jules Verne in a comfortable modern car! It’s more than affordable with car rental Nantes – it’s really cheap! Fill in the search form and check the lowest car rental prices ever! Car rental Nantes will provide you with the best car rental deals to suite any purposes and any car hire budget. You make your car rental reservation online quickly and easily with our simple booking procedure. Forget about all the car rental hassle because it’s our task now! And you can just relax and enjoy reliability and comfortable drive with car rental Nantes! 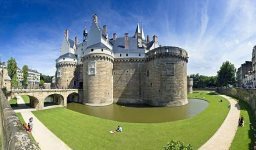 Decide on the most suitable Nantes car rental location and don’t forget to look through Must Know and Places to Visit with car rental Nantes! Nantes is one of the most beautiful cities in France, as well as the administrative center of the department of Loire-Atlantique. 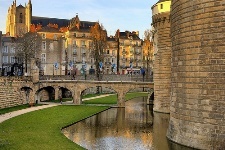 Also Nantes is the sixth largest city in France. Nantes is world famous for the fact that Jules Verne was born here - the master of science fiction. Nantes can easily be called a green city as its territory has numerous parks and gardens. One of the botanical gardens of the city usually holds a festival of flowers called "Florial". After exploring the city with all its unique sites you will agree that Nantes is multi-faceted and captivating French city. Powerful road infrastructure of France makes car traveling extremely attractive! Drivers who are going to travel a lot in the countryside and make trips from one city to another should take care of getting a car with GPS-navigator. The fact is that traffic signs are not on the right places even on the most popular routes. All types of roads have their speed limits. In cities you must drive not faster than 50 km/h, in the countryside – not more than 90 km/h, and you can speed up to 110 km/h on the highways. The Castle stands on the right bank of Loire, and once the water in the moat around the castle was connected to a river. Today the castle is completely renovated and fully open to the public. 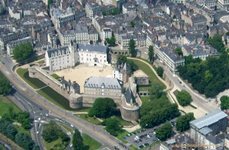 The History Museum located in the castle is a really exceptional place telling about the turbulent centuries of life in Nantes in interesting form understandable for both adults and children. Make walk along the castle walls offering a view of buildings and courtyards of the castle and the whole city. Drive your car rental vehicle to the Castle and make it the start point of your city exploring! That means "Unique place" which has taken the theater and the art of music under its roof, plus dance, painting and sculpture – so it’s like a museum-theater, a bar, a restaurant and even a hammam. We’ve bet you’ve never been to a place like this before! So jump into your car rental vehicle with your friends and have a really good time at “LU”! 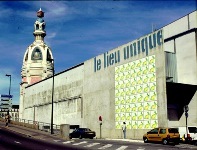 That is the name of the artistic and cultural project based in Nantes. This project aims to promote the creation and popularity of creative metropolis made ​​up of dreams and fantasies. Machines island was created in the warehouses of the former ship docks by the artists François Delarozer and Pierre Orefis. Their work was based on the journey through time and space at the intersection of imaginary worlds of Jules Verne and the mechanical wonders of Leonardo da Vinci. Among the highlights of the park are: Great Elephant, Wonders of Sea World Carousel and the Tree of Herons. 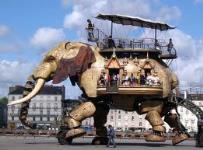 The great elephant is 12 meters high and 8 meters wide, a huge mechanism is made of 45 tons of wood and steel. It can lift up to 49 passengers on a 45-minute walk. Jules Verne – the great novelist, the author of adventure novels "Journey to the Center of the Earth" and "Around the World in 80 Days", was born in Nantes in 1828. Among the museum exhibits you’ll see numerous personal writer’s things and the subjects that inspired him to create literary works. 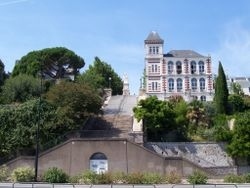 Fans of the writer's work can also go to the street de Clisson 4, where Verne’s house is located on the Ile de Feydeau. Drive your car rental vehicle around these historical places! RentalCars24h.com offers you reliable car rental Nantes services that will help you to feel free and independent when moving around the town. Providing best online prices for car hire Nantes services, RentalCars24h.com allows you to save money each time when you rent a car in Nantes.